In this post I will go over the contents of and purpose for each item in the Individual First Aid Kit (IFAK). I will give you details on how it is used and what exactly to use in the kit. But the best equipment in the world won’t do you a bit of good if you don’t know how to use it! Get training! In my last post I gave you some basic information on what emergency medical care is. If you haven’t already read that post, it can be read here (EMERGENCY MEDICAL CARE: Part 2 – What, Why & How). Right out of the gate I want to let you know that I don’t believe that airway and breathing require equipment at the basic “first aid” level. Get in there, establish an airway and get the person breathing. I believe that to be the most basic of skills and it doesn’t require any equipment at this level. Yes, you can use a rescue breathing mask to prevent the exchange of potentially infectious fluids; but I don’t put them in my kits. I’ve not had good results in using them and I think in a critical situation they might cause a delay or complicate getting breathing started. But the choice is yours; rescue breathing masks are very inexpensive and compact; they can also be invaluable to prevent potentially infected body fluids transferring from the patient to you. 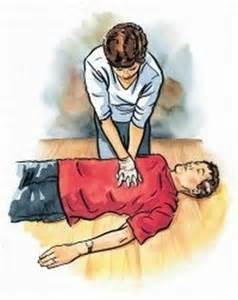 I view CPR as a skill vs. an equipment issue. • To prevent death by bleeding. • Kit is carried by each person in a readily accessible external location. • You use your kit for yourself, not someone else. • Kit must be as lightweight as possible but still able to accomplish the mission. This is subset of an IFAK but I believe it belongs in this category. But hey, if you don’t want to use a Blow Out Kit then just ignore this section. To stop or slow major bleeding as quickly as possible until you can access your IFAK. In the external cargo pocket of your pants. When in the outdoors or participating in a disaster response I am a big believer in pants with cargo pockets. I place my BOK in my left front cargo pocket. My family members, buddies and I have adopted the same standard. Why? So while we are sitting around a campfire and my friend goes down because someone mistook him for an elk and shot him, I know right where his BOK is without spending precious time searching for it. 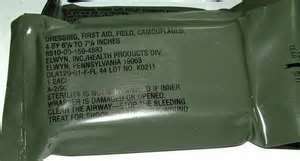 Dressing, First Aid, Camouflaged, 4” x 7”, Sterile : NSN# 6510-00-159-4883 – Elwyn Inc. 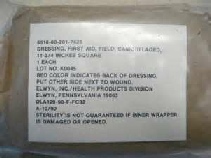 This bandage is classified as a small for wounds such as gunshot or cuts smaller than 6” in length They come with 2 ties and safety pins. Tip: Don’t get carried away with “contents” or you will find yourself with a bulky uncomfortable pocket full of stuff. The only thing this is meant to do is to stop bleeding until you can get to an IFAK or higher level emergency medical care kit. And since it is only a single dressing you can always have it on you. Note: If you are in the field (vs. camp) you should have your IFAK on your person. This BOK is for immediate use around camp when you are not wearing your hunting vest or pack that has your IFAK attached. Or, optionally, you just have to get to that single life-saving bandage faster than you can get into your IFAK. 3. To prevent death by bleeding. Your Individual First Aid Kit is worn on your person when in the field. It can be attached to a MOLLE vest, any belt, etc. The carrier needs to be sufficiently large enough to carry all the kit contents but small enough to not get in the way. It must be able to stand up against hard field use as well as rough weather conditions. 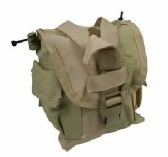 I suggest the military MOLLE 1-quart canteen cover. Designed to hold 1 Quart US Military . Heavy duty water repellent, puncture & tear resistant Cordura nylon material (1000 Denier Nylon). Two small side pockets for miscellaneous items. Internal drawstring with cord lock. Attaches to MOLLE System or belt. 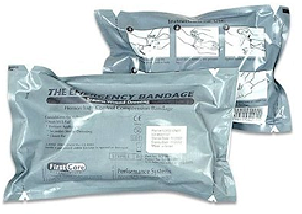 • Dressing, First Aid, Camouflaged, 4” x 7”, Sterile : NSN# 6510-00-159-4883 – Elwyn Inc. Note #1: Be cautious about adding additional items. 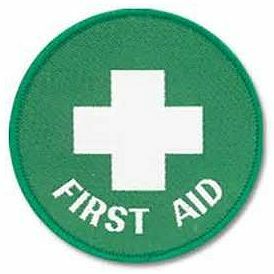 Always carry whatever first aid supplies you feel you may need. However, remember that each item adds bulk and weight to your gear. Note #2: If you are going to be in a “grid-down” situation or anytime you might be subjected to being shot (i.e. 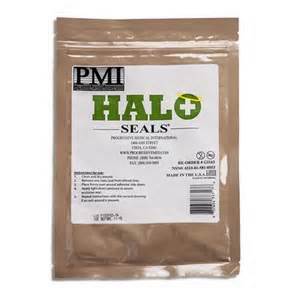 hunting), then I would consider adding a HALO Chest Seal – High Performance Occlusive Dressing NSN# 6510-01-581-0553 by Progressive Medical. The package comes with two seals for entry and exits holes. 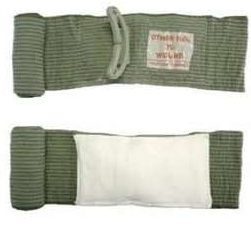 Dressing, First Aid, Camouflaged, 11 ¾” x 11 ¾” : This bandage is classified as a medium for larger wounds such as intestinal or larger areas of burns, etc. Dressing comes with 4 ties and are very absorbent (1 unit of blood). 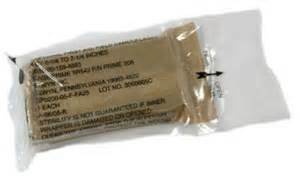 Dressing, First Aid, Camouflaged, 4” x 7” : This bandage is classified as a small for wounds such as gunshot or cuts smaller than 6” in length They come with 2 ties and safety pins. Dressing, Trauma Wound, 4” (a.k.a. 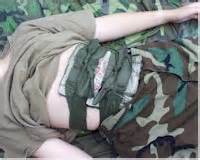 Israeli Battle Dressing) : This bandage is classified as small for wounds such as gunshot or cuts smaller than 4” in length. This bandage can be applied with one hand, has an easy securing device, and can be used as a tourniquet. Probably the single best wound dressing that I have ever seen. It is used extensively by the military and has a wide range of injury applications. 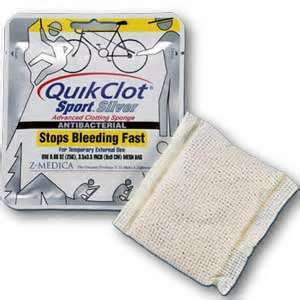 Quick Clot, 25 gram : Quick Clot is hemostatic agent sponge that stops/slows bleeding. There is the added antibacterial advantage of ionic silver. Silver acts to prevent the growth of bacteria and fungi which can be especially important if medical care is not immediately available. Remember – You must stop the bleeding! Quick Clot adds a huge advantage to getting even severe bleeding stopped. 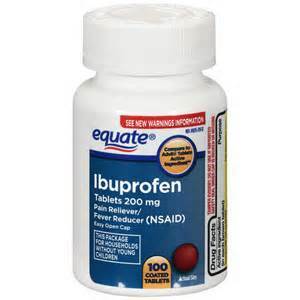 Ibuprofen : Ibuprofen is a nonsteroidal anti-inflammatory drug (NSAID). It works by reducing hormones that cause inflammation and pain in the body. It is used for the management of mild to moderate pain, fever, and inflammation. Celox : Celox is simple to use and highly effective. CELOX granules quickly control even the most severe arterial bleeding. Just pour it in, pack it, and apply pressure. No specific training is required. 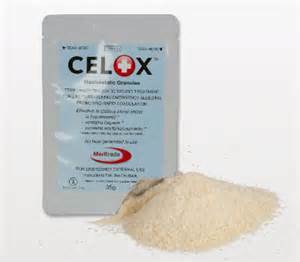 CELOX clots blood fast, works in hypothermic conditions and also clots blood containing heparin or warfarin. CELOX does not generate heat in use and won’t burn. Celox is safe to use for the entire body including head, neck and chest wounds. 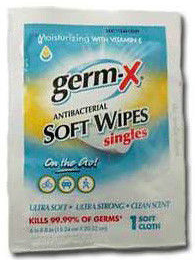 Germ-X Wipes : Kills 99.99% of Germs. Used for sanitizing hands or surfaces such as around wound areas. No, I don’t believe in bottles of hand sanitizer for a medical kit, they leak. 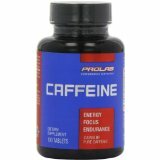 Caffeine : Caffeine Maximum Potency 200mg Tablets by ProLab These will help me stay awake when it is absolutely necessary. Before you decide to use caffeine read labels, warnings, and directions before using or consuming a product. This is just telling you what I do, NOT what you should do.